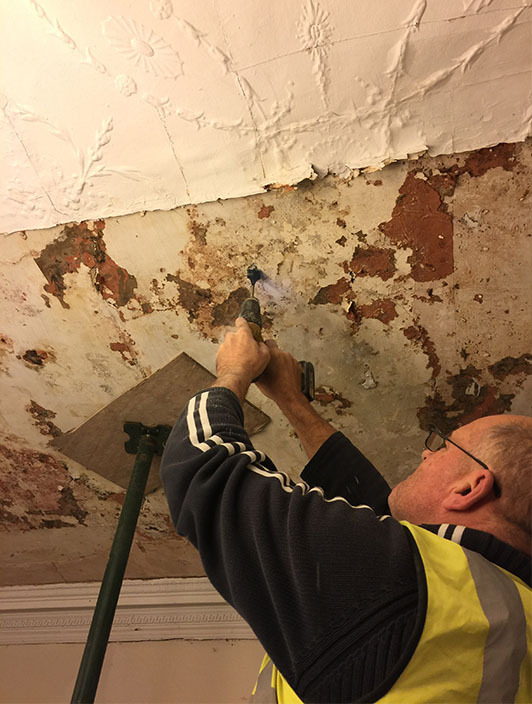 We were delighted to return Insole Court in January, and complete the stabilisation of some unusual large scale anaglypta wallpaper panels, which had previously suffered significantly from water damage, and in some areas had to be removed to allow for essential stabilisation and repairs to the ceiling, itself a combination of both lath and plaster and highly degraded hessian reinforced plaster panels. 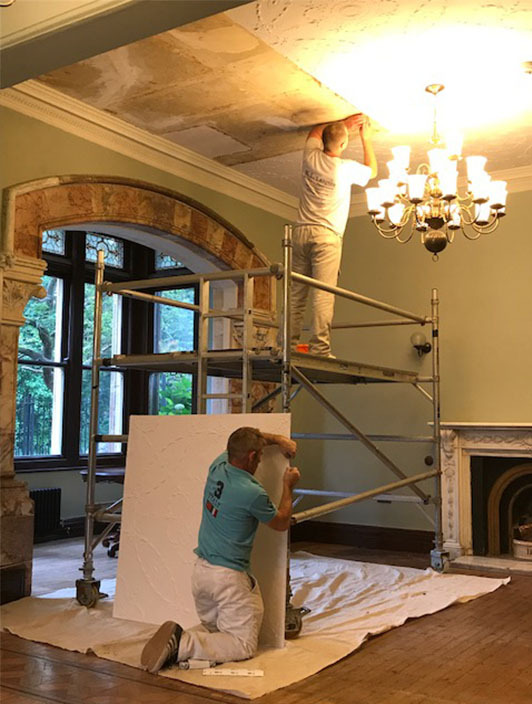 Hirst Conservation undertook a large programme of works in 2015-16 at Insole Court, Cardiff, including a wealth of architectural paint research, plaster works, ceiling stabilisation, recreation and redecoration. Having been closed since 2006, due to health and safety concerns, areas of the house, and redeveloped buildings have gradually been opened to visitors and events. 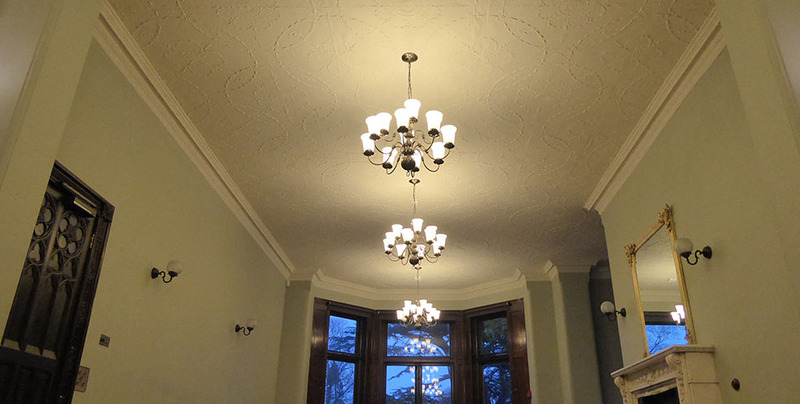 However, final completion of this ceiling had to be put on hold whilst issues with the plumbing and leaks were resolved by the project team including the excellent Amanda Needham then of Purcell architects, and the tireless team at Insole Court. 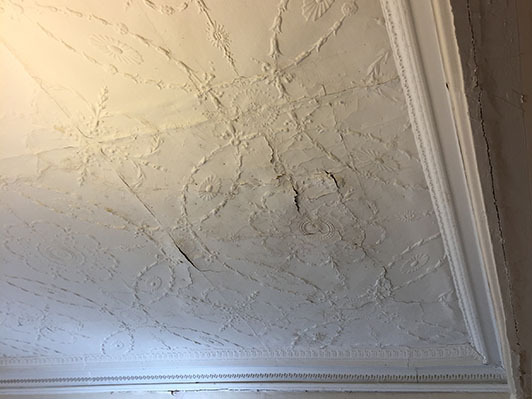 Earlier schemes to this 1860’s ceiling include highly decorative stencilling consolidation of unstable panels was therefore undertaken conservation materials suitable for long term reversibility. More information about the wonderful history of Insole Court is available on their website https://www.insolecourt.org/, and we will keep watching with great interest as they find ways to both open up the house to serve the local community, and continue this programme of conservation. We may also share some other images showing prior works to the house, and the wonderful earlier decorative schemes in another post.